I’m behind. I know what you’re thinking: Does the sun still rise in the east? Though I may be late, I never seldom only periodically miss a chance to tell you about some great books that are getting attention in important quarters. I was just clearing up my desk — it happens — and came across a few lingering Harry Potter related items. The first is this cool photo (click to enlarge) from the release party (movie watchers are in the background) sent in by Samara Thompson. Thanks, Samara! The others are written. First, you’ve probably heard that Harry Potter and the Deathly Hallows sold pretty well in its first week of release. Shock! Among the many sales reports that caught my eye was this one in the USA Today in which J.K. Rowling simultaneously holds eight of the top 20 spots in a single bestseller list. Not a bad week, m’am. The other is an interview with Ms. Rowling in which she mentions she’s already writing again. I think it’ll be interesting to see whether the masses will be enthusiastic for the first non-Potter book. Was it Harry or Rowling’s magic touch? By the way, if you still need a copy, I know the place. Get one while they’re still selling them for 25 percent off! We all think the “crazy” in Crazy Daze stands for “amazing deals” or “whacky outfits” or the manner in which we eat, throwing all nutritional standards to rabid wolves (personally, I am fond of those “porkies” the Lions Club serves up). And maybe we’re right. But I formed another theory during the 2007 edition Thursday: Perhaps the “crazy” is more literal than we give it credit for. Perhaps it’s called crazy daze because the downtown Northfield bargain bonanza always seems to be held on a day so hot it melts the mind (actual temp-95; “feels like”-135). I’ll leave that probing scientific question to the meteorologists among us. What I do know is that despite weather so steamy as to test one’s sanity, people came to River City Books in bunches, and they walked away with some pretty sweet deals. They bought DVDs, CDs, and trade books for 10 percent off, and they found college clothing at prices like they rarely see them anywhere. 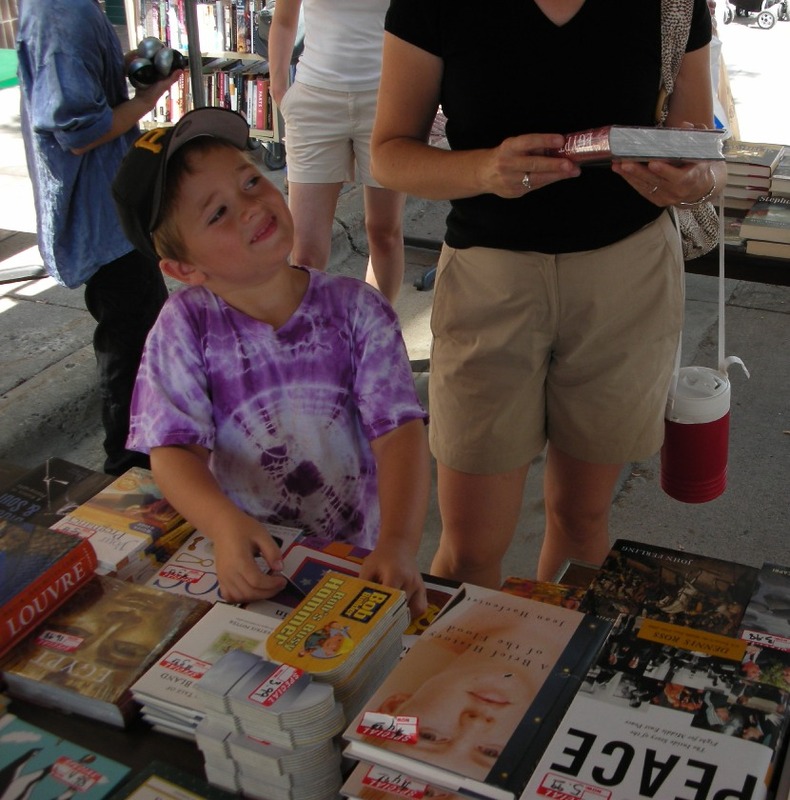 Of course, they also ventured under the big tent where by my unofficial count they found a gazillion bargain books. Check out the slideshow above for snapshots (click to enlarge). Inside, where the weather was cool and clear, not only was there a storewide sale, several gathered to listen to Loretta Ellsworth discuss her most recent novel, In Search of Mockingbird, which was on sale for 15 percent off. Thanks to Ms. Ellsworth for making the appearance. She gave an excellent talk about the impetus for writing the book; her experiences researching the book and traveling to Alabama; and her writing career. I’ve got to go drink some more liquids, but to hear some of Ellsworth’s remarks click below. The intro is slightly muffled (my apologies) but her full talk should be audible. 1. You can buy a copy of Harry Potter and the Deathly Hallows without waiting in a really long line in the middle of the night. 3. 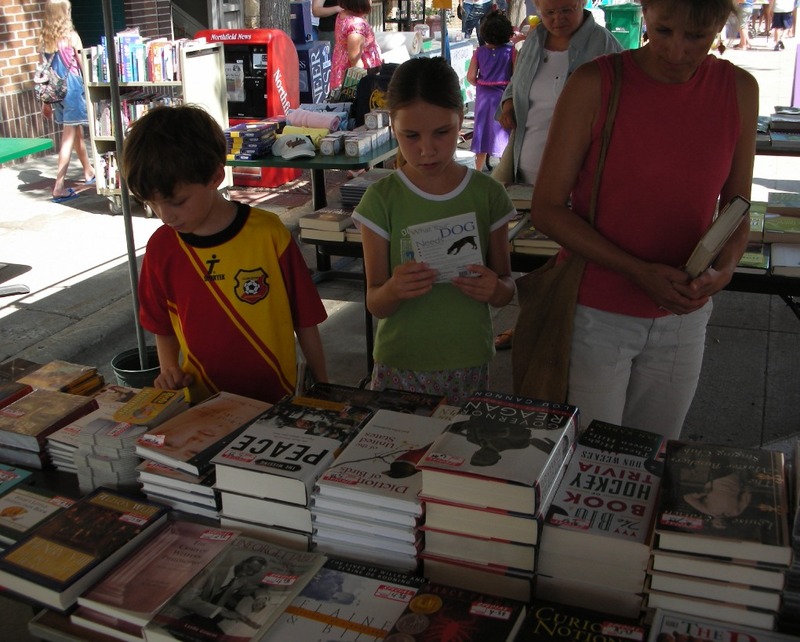 What other day of the year can you buy bundles of bargain books while standing under a tent in the middle of the street? 4. Meet store manager Jon Lee, recently featured on the front page of the Northfield News. 5. Three words: Free air conditioning. 7. Buy a copy of this book (or any other in the store) for 10 percent off. 9. You need a new DVD. You want a new DVD. You must buy a new DVD. And, as luck would have it, all of RCB’s DVDs are on sale for 10 percent off. 10. Did I mention there will be hundreds of bargain books? What a run in downtown Northfield. Last week there was the Taste of Northfield. What a tasty event that was. I’m still impressed, days later, by the turnout and enthusiasm for Harry Potter: Release 7.0. And now, when you think maybe it’s time to go on vacation, or plop on the couch and not get up, there’s soon another compelling reason to venture downtown: Crazy Daze 2007 is just three days away. I mean, seriously, if it was like this every week we would have to beat people off with heavy sticks. Everyone would want to live here. And think of the parking problem then! Anyway, I need to tell you about River City Books’ involvement in this annual festival of downtown retail because it’s pretty insane. In case you are wondering … Scholastic, publisher of paper gold, estimated that 8.3 million copies of the 12 million first printing of Harry Potter and the Deathly Hallows sold in the U.S. on Saturday. 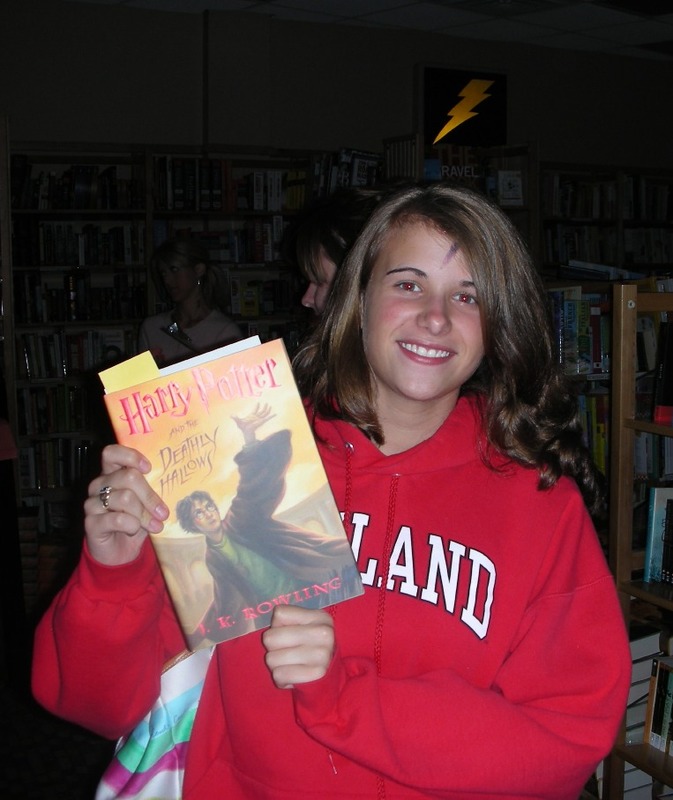 By contrast, in 2005, some 6.9 million copies of Harry Potter and the Half-Blood Prince sold on the first day. I should also note that if you haven’t yet purchased your copy stop by the old neighborhood bookstore. Sales were brisk — some 675 were sold — but RCB still has some and they’re still selling them at discount. They came, some of them, more than six hours early. The line stretched to Bittersweet. And the people were still coming. By dusk Division Street was full. Some played human chess in front of Present Perfect. Others watched an instructional video featuring Mary GrandPré at ArtOrg. Others belted out their favorite Potter passages at The Contented Cow. The crowds gathered round to listen to Professor Snape read. 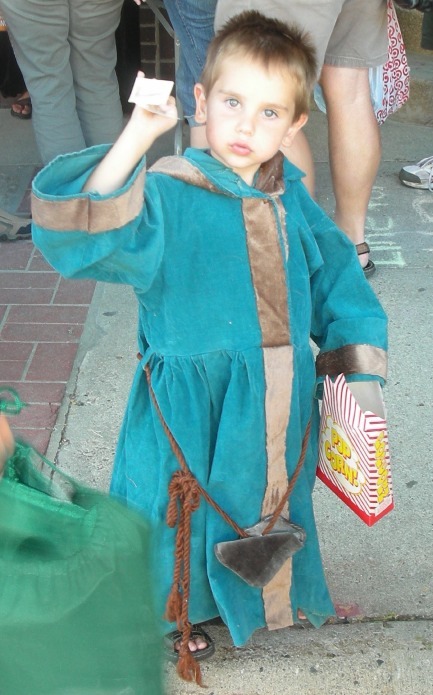 Hundreds dressed in costumes and more than a hundred participated in River City Books’ costume contest. Every Harry Potter-esque character you think of — and a few you cannot — was on hand. Muggle Dogs were eaten. Butterbeer was consumed. By the barrel. 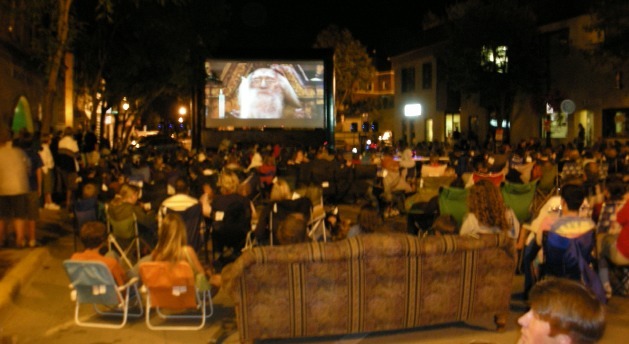 As “Harry Potter and the Sorcerer’s Stone” was shown on the giant movie screen erected in the middle of Division Street, people sat on chairs, on the curb, and in couches. That’s right; I saw more than one sofa along Northfield’s main street. The weather was nothing short of perfect. 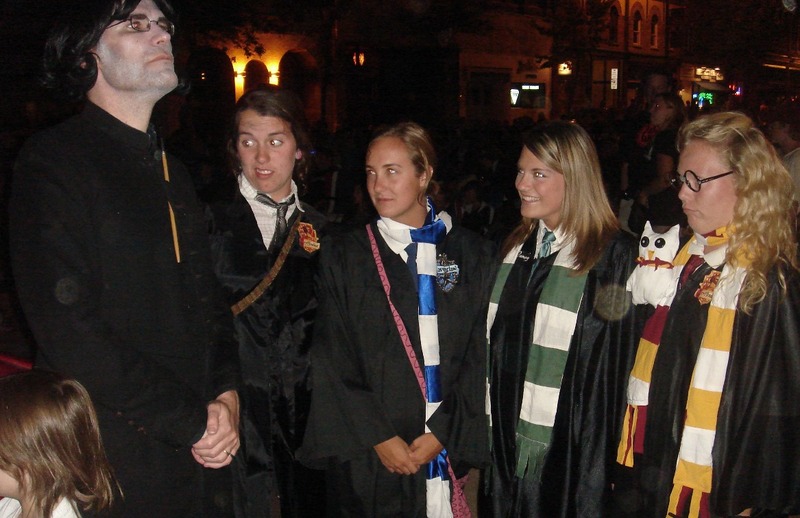 I am simply amazed — and heartened— by the pleasure I found during Friday night’s celebration of the release of Harry Potter and the Deathly Hallows. Most likely for the last time in all of our lifetimes people lined the streets, in the middle of the night, all across the country, all across the world, to buy a book. They waited for printed pages bound by hardcovers. There is no LCD screen. Nothing makes noises. There are no bells, whistles or exploding devices. I saw thousands of happy faces Friday night and Saturday morning — some of them downright giddy — and all because of a book. I’m proud to have been in downtown Northfield for this historic occasion and prouder still that I live in a place with so many well-meaning people who made a night like that one possible. I took as many photos as I could; there’s a scrolling slideshow below. Also, check out other local online photo galleries, such as Doug Bratland’s at Northfield.org and Griff Wigley’s Pottermania collection. The NDDC also has a post on this topic worth checking out. I’ll remember the night for a long time and I suspect many images will linger. I enjoyed the communal viewing and couldn’t believe the numbers — more than a thousand, easy — who joined the movie-going crowd. I was happy when I heard sincere thanks given to members of the River City Books staff. People were thrilled by the chance to celebrate in such grand fashion. I’ll remember the joy and the kindness, the countdown at midnight, and the controlled chaos. 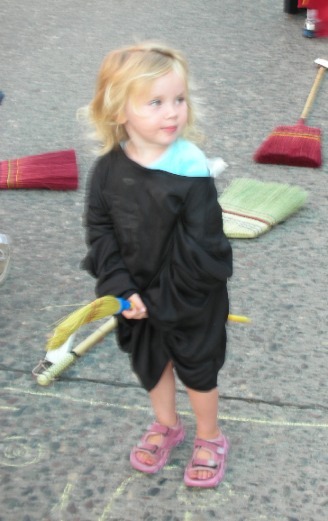 Perhaps my favorite moment, though, came while watching this cute little blond-haired girl tried to “ride” her broomstick in the six-legged Quidditch races. She wasn’t the quickest player to toe the line. But she rode as fast as she could, never taking her eyes off her mom and never allowing the smile to leave her face.